What do you do on your days off? Maybe abuse Netflix a bit, make a start on the Christmas shopping? Well I can almost guarantee that it’s not crawl around medieval churches looking for seven hundred year old graffiti – but such are the strange opportunities which present themselves to you at university. During those first few weeks at uni you inevitably give innumerable people and societies your email address, some of which you will live to regret, but it does mean that all sorts of events and opportunities will unexpectedly appear in your inbox on top of those that you regularly receive from your department. 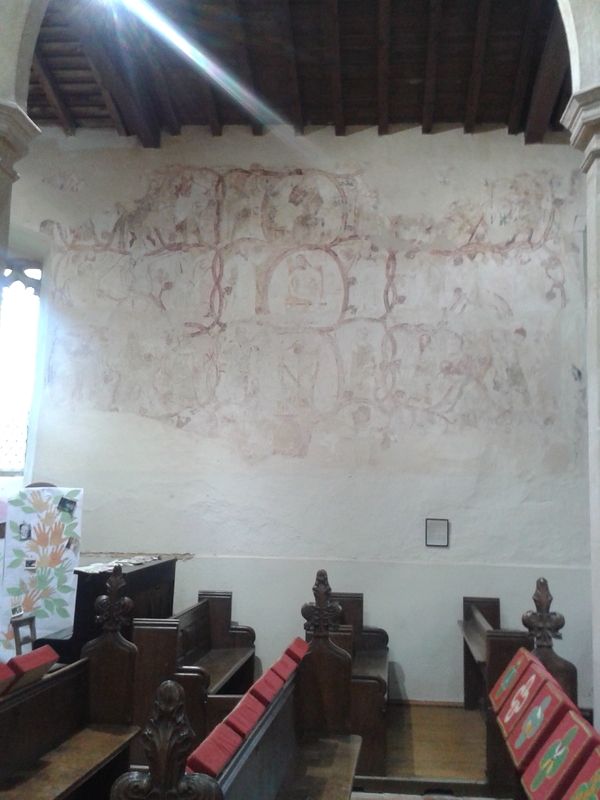 For example, this week I received a message from one of UEA’s resident medievalists about a little field trip to look at some of the local medieval churches, focusing on their art but also on the work of the Medieval Graffiti survey (medieval-graffiti.co.uk) which seeks to catalogue and interpret the odd marks left to us by our ancestors. It turns out that those strange scratches which I used to tut at, bemoaning the vandalism of such beautiful buildings, are in fact the remnants of a long forgotten language of symbolism. 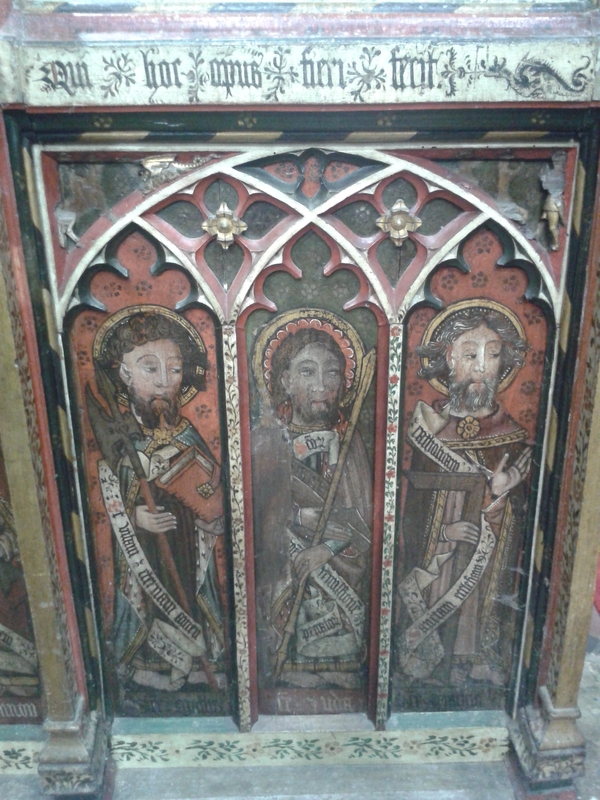 I was also lucky enough to see some of the finest examples of church painting, most of which was destroyed or covered up during the reformation, which is available to us today. It’s a reminder that the dreary, grey image that many of us have of the Middle Ages, is in fact a far more modern invention. Our plain, sometimes sterile, churches would have been a shock to a medieval peasant who, even if from the smallest parish, would have associated the church with bright, almost garish, colours and a kind of pageantry now rarely seen. But I digress. This post is not about my willingness to lose a few toes to frostbite in the name of academia, but rather the importance of regularly checking your inbox. All sorts of things find their way there, from auditions to free screenings, job advertisements to those shady experiments the psychology students are always trying to get you to take part in… Thanks to these emails I am now involved with the LGBTQ Bookclub and hopefully soon to write a review for the uni’s student newspaper Concrete. Maybe not your cup of tea, but you get the point. Adopting the ‘Yes Man’ attitude is a great way to meet people as well, especially those with the same hobbies or research interests as you, thanks to my little history jaunt I have now met quite a few of the lecturers whose courses I am looking to take in the next few years, as well as PhD students who can still just about remember how daunting starting uni can be. Everyone will be telling you from the minute you set foot on campus, actually scratch that – from the moment you send off your UCAS application, to throw yourself into uni life, but it’s important enough of a point that I think it bears repeating. And besides, you’re paying nine grand for the privilege, so why not make the most of it?